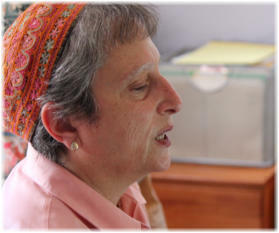 Wednesday, 14 January 2015 Rabbi Deborah J. Brin A few days ago, I did what I do every day. I put a house key in my pocket and took the dog for a walk. When I returned, much to my dismay, even though I had the key I was locked out. The screen door had somehow locked behind me when I left the house, so I was unable to get to the real door that had the lock in it. I wished I could have solemnly said, in a magician’s stentorian voice: “abracadabra, the screen door will now unlock itself.” Did you know that “abracadabra”, a magical incantation, is probably from the Aramaic? It is pronounced ‘abra’ ‘c’dabra’ and means something like: I create that which I speak. Words have great power. We are told that God created the world by speaking. “God said, let there be light, and there was light.” [Gn.1:3] Human beings across many cultures have believed that if you know the exact right words to speak, in the exact right way, then the speaker will have great power. It was also believed that great power was inherent in the very name of God, and could be a “mighty and awesome force” if the name was known and properly pronounced. [Trachtenberg, p.79]. We have many names for God in our tradition. You may recognize some of them: El, Elohim, Shaday, Tzur Yisroel, HaMakom, Adonai, Adonai Eloheinu, Ribbono Shel Olam, HaKadosh Baruch Hu, HaRachaman, Ayn Sof, to name just a few of them. Why do we have so many names for God? One reason is because we are trying to speak about something that is impossible to put into words. Each name is said to embody different characteristics of the One Underlying Unified Reality. ???? Yah is another name for God. This one is thought to be a shortened version of the unpronounceable name of God depicted by 4 Hebrew letters, Yud Heh Vav Heh. These four letters, sometimes transliterated as YHWH, are referred to as the ‘tetragrammaton’. This name of God Yud Heh Vav Heh appears 6,823 times in the Hebrew Bible. What do these four letters mean? Each Hebrew word is made up of at least three letters, called the ‘root’. Every Hebrew word that has those same three letters at its core is related in meaning. Scholars say that the tetragrammaton, the YudHehVavHeh, comes from the root that means “to be”, or “to exist”. The root is ‘heh, vav, heh’. Other scholars say that the four letters YudHehVavHeh connote a special form of existence where past, present and future are all the same. [Tur, Orach Chaim 5 = Yaakov ben Asher, 1270 – 1340]. Rabbi Arthur Green, a modern mystic and scholar, says that “Yod, Hay, Vav, Hay. . . [is a] configuration of the verb to be, [and is] translated something like “all of being and becoming” or “is-was-will be”. [“God, World, Person: A Jewish Theology of Creation” Dr. Arthur Green; Melton Journal/Winter/1990]. The meaning of YHVH as Existence is underscored in the Biblical narrative about Moses and the burning bush. In the beginning of the Book of Exodus, in chapter 3, we are told the story of Moses’ encounter with YHVH. Moses is off tending his father-in-law’s sheep when he sees a bush that is aflame with fire, a bush that is burning, but like some magical visual effect in a movie, the fire isn’t damaging the bush at all. This catches Moses’ attention, and he turns aside to get a closer look. This is when Moses’ first direct encounter with YHVH begins. Once YHVH has his attention, he gives Moses his marching orders. Moses is to go to Pharaoh in Egypt and release the Israelites from slavery. Moses wants to know what kind of credibility he is going to have with the Israelites, and asks, who shall I say sent me? Because God’s name is so hard to translate, some Biblical texts just transliterate the Hebrew and say, tell them “Ehyeh Asher Ehyeh” sent you. Other texts, basing their translations on the concepts of ‘existence and being’ say things like, “I Am That I Am sent you”; or “I Will Be What I Will Be” sent you. Let’s skip forward in time to the days of the ancient Temple when we still had a High Priest. He would go into the Holy of Holies on Yom Kippur and pronounce the secret name of God three times, during each of the three confessions that he made. Before venturing into the Holy of Holies, the High Priest would engage in arduous preparations so that he would be ritually pure, and spiritually and intellectually prepared for the task of pronouncing the secret Name of God. Immediately before entering the Holy of Holies, he would tie a rope around his ankle. Why? Because any mistake inside the Holy of Holies could be deadly. Since he was the only one allowed into the Holy of Holies, pulling on the rope would be the only way for the priests with lower rank to get the body out. At some point, the Talmud says 40 years before the destruction of the Temple, the priests stopped pronouncing the Name. [Yoma 39b]. Eventually the knowledge of how to pronounce it was lost. Two of our oldest prayers, the Barechu and the Shema, come from the early Temple period and they have the YudHehVavHey, the unpronounceable letters of God’s name in them. How do we pronounce if it is a secret? We use a substitution. Over and over in our liturgy, whenever we see the YHVH, the four letters that represent existence, being, and breathing, we customarily say: “Adonai”, a word that means “my Lord or my Master”. It is no wonder that people are reluctant to talk about God when we are taught to refer to God in hierarchical, gendered terms. The typical language we encounter when we open a prayer book can frustrate our efforts to be engaged in a personal spiritual journey. We bounce away from the text rather than enter into its deeper meanings. In the ‘70’s women in particular started experimenting with God language because we felt disenfranchised. It wasn’t long before men joined us in the process. The traditional emphasis on hierarchical, anthropomorphic, masculine gendered God-language was alienating and off-putting. We have tried to create other ways to pray and there have been many different formulations attempted. Some of them have survived in popular usage long enough to be printed in the newest liberal prayer books. One example would be “N’varaych et Ayn HaChayim… let us bless the Source of Life” created by Marcia Falk, a contemporary feminist poet who writes in both Hebrew and English. That language tips the hierarchy over and makes it inclusive and accessible, while at the same time referring to a sense of the Divine as the Source of Life. The prayer book that we use on Shabbat, inspired by Reb Zalman Schachter-Shalomi and edited by Rabbi David Zaslow, uses primarily traditional God language and occasionally substitutes “ruach/spirit” for “Melech/king”. An example would be Rabbi Shefa Gold’s morning chant of gratitude the ‘modah ani/modeh ani’ prayer uses ‘ruach’ in place of ‘melech’, spirit in place of king. The translation becomes I gratefully acknowledge You, Living and enduring Spirit. The prayer book offers three formulations to choose from for the morning blessings: the traditional one in the masculine and two others in the feminine. It also liberally uses Yah in place of the unpronounceable YHVH. Yah is a Biblical name for God, and is thought to be a shortened form of it. The word Halleluyah, is a word that has migrated from our tradition into other religious traditions. It is a compound word made up of ‘hallel’ to praise, and ‘Yah’, God. Halleluyah means: let us praise the unexplainable source of existence, the underlying one-ness of all things. It is much easier to play with the language about God in the English than in the Hebrew. One of the reasons that experimenting with God language has been so difficult is that Hebrew is a gendered language and the formulations are either in the masculine or the feminine. For most of us, learning to say the blessings and the prayers the way most “normative” Jewish communities say it is hard enough. To try to get our mouths around new phrases in the feminine is too hard and uncomfortable for most people. Last night we spoke about music as a metaphor for community. The band played the song written by Rabbi Moshe Shur called Ivdu Et HaShem B’simcha. A phrase from Psalm 100:2, that means “serve God with joy”. When we all were singing it, I advised the Hebrew readers not to use the text itself, which says serve YHVH, but instead to look at the transliteration and use what it says: serve HaShem – serve The Name with joy. HaShem is a traditional way of referring to the Isness of the Universe without using one of God’s names. There is another formulation that I was introduced to recently and would like to share with you. It is another Hassidic way of referring to the YHVH, the Existence, Being, Is-ness, the Unitive Consciousness of All Life. That is to say “ha-vah-yah”. It is the YHVH scrambled in a different order — HVYH. It still has all of the same letters, they are just in a different order and pronounceable. Havayah. I started experimenting with this formulation a few months ago and find it to be very liberating. Perhaps because I have no history with it, I have no baggage about it either. For me, there is no inherent implication of hierarchy, power-over, or gender. I don’t have to have a filter in place when praying by using Havayah. I find that saying ‘havayah’ is expansive rather than constricting, and makes it much easier for me to access a sense of myself as a participant in the existence of the universe, a drop in the Ocean of Being, or as Zalman would say, a cell in the Global Mind [heard at a lecture, Spiritual Director’s International, May 2014]. I encourage you to experiment with it, too. Rabbis Zalman Schachter-Shalomi, Art Green and Shefa Gold and Dr. Marcia Falk are all reporting in about a mystical experience of God. All of us can have mystical experiences of God, experiences that may be fleeting or expansive, where we become one with the universe, feeling ourselves breathing and being breathed. As an experiment, let’s do the Shema together. Rather than doing it in the usual fashion, let’s substitute ‘havayah’ for “YudHehVavHeh”. The translation of the Shema then becomes something like: Listen Up Everybody, Our God is being and becoming. Being- becoming is One. [adapted from Dr. Arthur Green “God, World, Person: A Jewish Theology of Creation” Melton Journal/Winter/1990]. Should you stand or sit when reciting the Shema? The simple answer is ‘yes’. If you are sitting when it is time to say the Shema, then you sit; if you already standing, then you stand. It is through the influence of the Reform movement that many of us choose to stand while saying the Shema. For this experiment choose a comfortable position for yourself that will maximize your ability to experience this familiar prayer in a new way. We’ll do the Shema several times, once altogether and then in a cacophonous way with everyone doing it at your own tempo. After all of the recitations of the Shema have stopped, we’ll do it one more time in unison and then remain in silence for a short time. Even for just a fraction of a second, during the recitation or in the quiet that follows, you may experience the radical awareness of life itself living you. Existence being you. An open and spacious sense of connectedness, being and becoming a part of the vast Oneness of the All of Everything. The first time we do it together, try drawing out the word Shema - - - give yourself time to tune in and pay attention. This is the new phrase: Shema Yisrael, Havayah Eloheinu, Havayah Echad. Shemaaaahhhhhh Quiet time Abraham Joshua Heschel said,”to be is to be holy”. I understand that to mean that we don’t have to do anything else but breathe, be, be aware of your aliveness. Live. Because God’s name is so hard to translate, some Biblical texts just transliterate the Hebrew and say, tell them “Ehyeh Asher Ehyeh” sent you. The traditional emphasis on hierarchical, anthropomorphic, masculine gendered God- language was alienating and off-putting. All of us can have mystical experiences of God, experiences that may be fleeting or expansive, where we become one with the universe, feeling ourselves breathing and being breathed. Wednesday, 14 January 2015 Rabbi Deborah J. Brin A few days ago, I did what I do every day. I put a house key in my pocket and took the dog for a walk. When I returned, much to my dismay, even though I had the key I was locked out. The screen door had somehow locked behind me when I left the house, so I was unable to get to the real door that had the lock in it. I wished I could have solemnly said, in a magician’s stentorian voice: “abracadabra, the screen door will now unlock itself.” Did you know that “abracadabra”, a magical incantation, is probably from the Aramaic? It is pronounced ‘abra’ ‘c’dabra’ and means something like: I create that which I speak. Words have great power. We are told that God created the world by speaking. “God said, let there be light, and there was light.” [Gn.1:3] Human beings across many cultures have believed that if you know the exact right words to speak, in the exact right way, then the speaker will have great power. It was also believed that great power was inherent in the very name of God, and could be a “mighty and awesome force” if the name was known and properly pronounced. [Trachtenberg, p.79]. We have many names for God in our tradition. You may recognize some of them: El, Elohim, Shaday, Tzur Yisroel, HaMakom, Adonai, Adonai Eloheinu, Ribbono Shel Olam, HaKadosh Baruch Hu, HaRachaman, Ayn Sof, to name just a few of them. Why do we have so many names for God? One reason is because we are trying to speak about something that is impossible to put into words. Each name is said to embody different characteristics of the One Underlying Unified Reality. ???? Yah is another name for God. This one is thought to be a shortened version of the unpronounceable name of God depicted by 4 Hebrew letters, Yud Heh Vav Heh. These four letters, sometimes transliterated as YHWH, are referred to as the ‘tetragrammaton’. This name of God Yud Heh Vav Heh appears 6,823 times in the Hebrew Bible. What do these four letters mean? Each Hebrew word is made up of at least three letters, called the ‘root’. Every Hebrew word that has those same three letters at its core is related in meaning. Scholars say that the tetragrammaton, the YudHehVavHeh, comes from the root that means “to be”, or “to exist”. The root is ‘heh, vav, heh’. Other scholars say that the four letters YudHehVavHeh connote a special form of existence where past, present and future are all the same. [Tur, Orach Chaim 5 = Yaakov ben Asher, 1270 – 1340]. Rabbi Arthur Green, a modern mystic and scholar, says that “Yod, Hay, Vav, Hay. . . [is a] configuration of the verb to be, [and is] translated something like “all of being and becoming” or “is-was-will be”. [“God, World, Person: A Jewish Theology of Creation” Dr. Arthur Green; Melton Journal/Winter/1990]. The meaning of YHVH as Existence is underscored in the Biblical narrative about Moses and the burning bush. In the beginning of the Book of Exodus, in chapter 3, we are told the story of Moses’ encounter with YHVH. Moses is off tending his father-in-law’s sheep when he sees a bush that is aflame with fire, a bush that is burning, but like some magical visual effect in a movie, the fire isn’t damaging the bush at all. This catches Moses’ attention, and he turns aside to get a closer look. This is when Moses’ first direct encounter with YHVH begins. Once YHVH has his attention, he gives Moses his marching orders. Moses is to go to Pharaoh in Egypt and release the Israelites from slavery. Moses wants to know what kind of credibility he is going to have with the Israelites, and asks, who shall I say sent me? Because God’s name is so hard to translate, some Biblical texts just transliterate the Hebrew and say, tell them “Ehyeh Asher Ehyeh” sent you. Other texts, basing their translations on the concepts of ‘existence and being’ say things like, “I Am That I Am sent you”; or “I Will Be What I Will Be” sent you. Let’s skip forward in time to the days of the ancient Temple when we still had a High Priest. He would go into the Holy of Holies on Yom Kippur and pronounce the secret name of God three times, during each of the three confessions that he made. Before venturing into the Holy of Holies, the High Priest would engage in arduous preparations so that he would be ritually pure, and spiritually and intellectually prepared for the task of pronouncing the secret Name of God. Immediately before entering the Holy of Holies, he would tie a rope around his ankle. Why? Because any mistake inside the Holy of Holies could be deadly. Since he was the only one allowed into the Holy of Holies, pulling on the rope would be the only way for the priests with lower rank to get the body out. At some point, the Talmud says 40 years before the destruction of the Temple, the priests stopped pronouncing the Name. [Yoma 39b]. Eventually the knowledge of how to pronounce it was lost. Two of our oldest prayers, the Barechu and the Shema, come from the early Temple period and they have the YudHehVavHey, the unpronounceable letters of God’s name in them. How do we pronounce if it is a secret? We use a substitution. Over and over in our liturgy, whenever we see the YHVH, the four letters that represent existence, being, and breathing, we customarily say: “Adonai”, a word that means “my Lord or my Master”. It is no wonder that people are reluctant to talk about God when we are taught to refer to God in hierarchical, gendered terms. The typical language we encounter when we open a prayer book can frustrate our efforts to be engaged in a personal spiritual journey. We bounce away from the text rather than enter into its deeper meanings. In the ‘70’s women in particular started experimenting with God language because we felt disenfranchised. It wasn’t long before men joined us in the process. The traditional emphasis on hierarchical, anthropomorphic, masculine gendered God-language was alienating and off- putting. We have tried to create other ways to pray and there have been many different formulations attempted. Some of them have survived in popular usage long enough to be printed in the newest liberal prayer books. One example would be “N’varaych et Ayn HaChayim… let us bless the Source of Life” created by Marcia Falk, a contemporary feminist poet who writes in both Hebrew and English. That language tips the hierarchy over and makes it inclusive and accessible, while at the same time referring to a sense of the Divine as the Source of Life. The prayer book that we use on Shabbat, inspired by Reb Zalman Schachter-Shalomi and edited by Rabbi David Zaslow, uses primarily traditional God language and occasionally substitutes “ruach/spirit” for “Melech/king”. An example would be Rabbi Shefa Gold’s morning chant of gratitude the ‘modah ani/modeh ani’ prayer uses ‘ruach’ in place of ‘melech’, spirit in place of king. The translation becomes I gratefully acknowledge You, Living and enduring Spirit. The prayer book offers three formulations to choose from for the morning blessings: the traditional one in the masculine and two others in the feminine. It also liberally uses Yah in place of the unpronounceable YHVH. Yah is a Biblical name for God, and is thought to be a shortened form of it. The word Halleluyah, is a word that has migrated from our tradition into other religious traditions. It is a compound word made up of ‘hallel’ to praise, and ‘Yah’, God. Halleluyah means: let us praise the unexplainable source of existence, the underlying one-ness of all things. It is much easier to play with the language about God in the English than in the Hebrew. One of the reasons that experimenting with God language has been so difficult is that Hebrew is a gendered language and the formulations are either in the masculine or the feminine. For most of us, learning to say the blessings and the prayers the way most “normative” Jewish communities say it is hard enough. To try to get our mouths around new phrases in the feminine is too hard and uncomfortable for most people. Last night we spoke about music as a metaphor for community. The band played the song written by Rabbi Moshe Shur called Ivdu Et HaShem B’simcha. A phrase from Psalm 100:2, that means “serve God with joy”. When we all were singing it, I advised the Hebrew readers not to use the text itself, which says serve YHVH, but instead to look at the transliteration and use what it says: serve HaShem – serve The Name with joy. HaShem is a traditional way of referring to the Isness of the Universe without using one of God’s names. There is another formulation that I was introduced to recently and would like to share with you. It is another Hassidic way of referring to the YHVH, the Existence, Being, Is-ness, the Unitive Consciousness of All Life. That is to say “ha-vah-yah”. It is the YHVH scrambled in a different order — HVYH. It still has all of the same letters, they are just in a different order and pronounceable. Havayah. I started experimenting with this formulation a few months ago and find it to be very liberating. Perhaps because I have no history with it, I have no baggage about it either. For me, there is no inherent implication of hierarchy, power-over, or gender. I don’t have to have a filter in place when praying by using Havayah. I find that saying ‘havayah’ is expansive rather than constricting, and makes it much easier for me to access a sense of myself as a participant in the existence of the universe, a drop in the Ocean of Being, or as Zalman would say, a cell in the Global Mind [heard at a lecture, Spiritual Director’s International, May 2014]. I encourage you to experiment with it, too. Rabbis Zalman Schachter-Shalomi, Art Green and Shefa Gold and Dr. Marcia Falk are all reporting in about a mystical experience of God. All of us can have mystical experiences of God, experiences that may be fleeting or expansive, where we become one with the universe, feeling ourselves breathing and being breathed. As an experiment, let’s do the Shema together. Rather than doing it in the usual fashion, let’s substitute ‘havayah’ for “YudHehVavHeh”. The translation of the Shema then becomes something like: Listen Up Everybody, Our God is being and becoming. Being-becoming is One. [adapted from Dr. Arthur Green “God, World, Person: A Jewish Theology of Creation” Melton Journal/Winter/1990]. Should you stand or sit when reciting the Shema? The simple answer is ‘yes’. If you are sitting when it is time to say the Shema, then you sit; if you already standing, then you stand. It is through the influence of the Reform movement that many of us choose to stand while saying the Shema. For this experiment choose a comfortable position for yourself that will maximize your ability to experience this familiar prayer in a new way. We’ll do the Shema several times, once altogether and then in a cacophonous way with everyone doing it at your own tempo. After all of the recitations of the Shema have stopped, we’ll do it one more time in unison and then remain in silence for a short time. Even for just a fraction of a second, during the recitation or in the quiet that follows, you may experience the radical awareness of life itself living you. Existence being you. An open and spacious sense of connectedness, being and becoming a part of the vast Oneness of the All of Everything. The first time we do it together, try drawing out the word Shema - - - give yourself time to tune in and pay attention. This is the new phrase: Shema Yisrael, Havayah Eloheinu, Havayah Echad. Shemaaaahhhhhh Quiet time Abraham Joshua Heschel said,”to be is to be holy”. I understand that to mean that we don’t have to do anything else but breathe, be, be aware of your aliveness. Live.